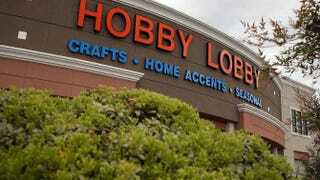 A sign on the exterior of a Hobby Lobby store on March 25, 2014, in Antioch, Calif. Throughout our history, black women across the country have felt the enduring sting of men controlling their reproductive freedom, infringing on their right to have or not have a child and access to birth control, and using religion as a basis for that control. A long history of denial of the right of black women to make decisions about their own bodies—an issue deeply rooted in and resulting from slavery, an institution also often rationalized in religious terms; government-sanctioned experiments and medical abuses; and current attacks defining black women’s wombs as “dangerous” have complicated and limited black women’s ability to make the best choices for themselves and their families. On Monday the Supreme Court issued its ruling in Burwell v. Hobby Lobby Stores, Inc., in which the plaintiffs argued that the Affordable Care Act’s requirement that they offer their employees coverage for birth control violates their religious freedom. The basis of the claim is grounded in the Religious Freedom Restoration Act, a 1993 federal law intended to prevent laws that substantially burden a person’s free exercise of his or her religion—but the court found that RFRA now applies to corporations. Although the Supreme Court has been the arbiter of historic decisions that rolled back discriminatory practices against African Americans and others, in this case it has ruled that employers can, in fact, use religion to discriminate in providing certain kinds of contraceptive coverage for their employees. A corporation can now withhold coverage for a government-mandated health care benefit that it deems in conflict with the faith of its management. And for the 83 percent of black women in this country who use some form of contraception, the decision could have far-reaching implications. We already know that black women pay a steep price when it comes to caring for themselves; many of us go without necessary medical treatment and services in order to make sure other budgetary needs are met. Keeping the lights on, putting food on the table and keeping a roof over the heads of family members often become greater, competing priorities. This ruling adds an additional burden and will force many to go without access to contraceptive care or pay out of their own pockets for what should be a covered benefit. It sets up a parallel reality in which some women, solely based on their employer, can have access to the full range of Food and Drug Administration-approved contraceptives covered under the ACA at no cost, while others cannot take advantage of a benefit provided by law, merely because their employer claims that religious belief forbids women’s right to that benefit. Contrast that with studies showing that when women have access to the contraceptive care they need, they are more likely to be economically stable, attain higher education levels, and plan and space pregnancies in a way that produces healthy babies and helps keep their families intact. According to a poll conducted by the Black Women’s Health Imperative in 2012, 86 percent of black men and women believe that the right to contraception is a part of basic health care services for women. The Supreme Court’s decision also sets a dangerous precedent that could embolden employers to decide against coverage for a range of other health care benefits. As Justice Ruth Bader Ginsburg noted in her dissenting opinion, there is “little doubt that RFRA claims will proliferate, for the Court’s expansive notion of corporate personhood … invites for-profit entities to seek religion-based exemptions from regulations they deem offensive to their faith.” Employers can now insert themselves in the personal decision-making that should be between a woman, her family and her doctor. Who knows what they may insert themselves into next? Now that the court has opened the door for employers’ religious beliefs to become yet another barrier to access care, black women across the country must double down on the fight for the right to make and act on the most personal of decisions regarding their health care. Black women were the originators of the movement for “reproductive justice,” a term first coined at a 1994 black women’s caucus of the Illinois Pro-Choice Alliance Conference. With ongoing attacks on a woman’s right to choose the best options for her health and her health care, it is time to reignite the battle cry that came out of that 1994 conference and engage a national dialogue that focuses on black women’s right to determine their own reproductive destinies. Linda Goler Blount is president and CEO of the Black Women’s Health Imperative. Follow her on Twitter.